WHO ARE WE & WHERE DO WE COME FROM ? grandson of Clovis, the king of the Fanks & the son of THEODEBERT the1st, named THEOBALDE. At the time of his death in 555, he reigned over Australia, the eastern kingdom of Roman Gaul. (Annex A & B) In Burgundy in the 5th Century, the name was changed in agreement with the various political & religious factions to THEBAUD, THIBAUD, THIBAUDE, THIBAULT, THIBEAULT, THEBAUDEAU & THIBAUDEAU. The EAU at the end of the name signifies that the person named was the son of a man called THIBAUD. In France in the 15th Century the family name was written as THEBAUDEAU. After the 15th Century it took the forms of THIBAUDEAU, THEBAUDEAU, TIBAUDEAU, THIBAUDEAULT, THIBEAUDOT, THIBAUDAULT & TIBODEAU. Our particular branch of the Family Tree originates in the Province of Poitu, namely in the Vendee region. 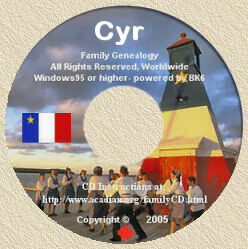 I came across your interesting website on the Acadians of Nova Scotia. My mother's family name is Thibadeau and they were Acadians who moved to Fort Kent, Maine, so I found it very informative. But your statement that the name Thibadeau (and its variants) was originally Germanic is probably not correct; a Gaul named Tibato is attested in the 4th century A.D. by Prosper of Aquitaine. He was a leader of the Bagaudae, Gallo-Romans who rebelled against oppressive imperial rule in northern France. So I think it more likely that the family name of Thibadeau, Thibodeaux, etc. is derived from the Gallic name Tibato. In Acadia in the last months of 1670 & January & February of 1671, the governor Monsieur De Grandfontaine, took the first census of Acadia. This was carried out by Fr. Laurent Moulins, a missionary under the direction of Sieur Hugues Randin, a French Engineer in the service of Count Frontenac, Governor General of New France. The family name taken by Fr. Moulins was written as THIBAUDEAU. Since the end of the 17th Century in North America, the general form of the name was THIBAUDEAU or THIBODEAU, except in Louisiana where it was THIBAUDEAUX. During the 15th & 16th Centuries, following the discovery of the New World by Columbus, there was a major undertaking by the Europeans & the British to expand their empires through colonization, to add to their treasuries through exploitation & to expand Christianity through their missionaries. This resulted in numerous wars being fought & territories being handed from one country to another through treaties being agreed to by the warring nations. time that he arrived at Port Royal, his family along with the rest of the Acadians were deported as they would not take an oath that they would not bear arms against England. There were no Acadians deported to Louisiana as it was part of the French Empire. Those Acadians who were determined to live under French rule made their way to Louisiana from their deportation sites in the New England colonies. Godparents were Rene Trahan & Marie Thibaudeau. The child was baptized by Fr. Jean Francois who was a missionary in Louisiana. The ancestors of the Kingston Ont. branch were deported to Philadelphia. They remained there until the 1760`s. From there some went to Northern New Brunswick, some back to Nova Scotia, many went to the Quebec City, Beauport area of Quebec. From there they began to migrate to Upper Canada & The United States. PIERRE THIBAUDEAU, the son of Mathurin Thibaudeau & Marie Delbeau. PIERRE was born in France in 1631 & settled in the Port Royal region of Acadia. Mathurin Thibaudeau, the son of Mathurin Thibaudeau & Marie Miet. He was born in France in 1617, came to New France in 1659 & lived in Montreal. living in Quebec City in 1667. Francois Thibaudeau, the son of Francois Thibaudeau & Marie Barbeau. He was born in France in 1724. He was a merchant in the Quebec, Gaspe region. St. Jacques- Moutiers, Vendee, France. PIERRE was born in St. Etienne de Marans France in 1631. On March 25, 1654, Emmanuel LeBorgne chartered an armed merchant vessel, The Chateaufort to sail to Port Royal Acadia. PIERRE THIBAUDEAU, who was contracted to serve LeBorgne for a period of three years was on that voyage. They sailed from LaRochelle, France & arrived at Port Royal Acadia near the end of May of that year. Having completed his contract with LeBorgne, PIERRE acquired a large tract of land situated 10 km. from the mouth of the Annapolis River. There he built a sturdy house, farm buildings, a sawmill & a gristmill. He became known as ( Le Meunier de la Pre Ronde ), the Miller of Round Hill. had a large family. In 1698, Pierre & several of his sons prepared to colonize the region of Chipoudie, known today as Riverside-Albert New Brunswick. They built a church & a mill on sites that are known now as Church Creek & Mill Creek. Marie born in 1660, she died as an infant. Marie born in 1661 ( known as the eldest ). Marie born in 1662 ( known as the youngest ). Anne-Marie born in 1665 ( known as the eldest ). Pierre born in1667 ( known as the eldest ). Pierre born in 1676 ( known as the youngest ). Anne-Marie born in 1682 ( known as the youngest ). Joseph born in 1691, he died in 1692. PIERRE THIBAUDEAU, Le Meunier de la Pre Ronde et Le Sieur de Chipoudie died in Port Royal on Dec. 26, 1704 at the age of 73. JEANNE TERRIAU died in Port Royal on Dec. 8, 1726 at the age of 82. Along with their 18 children they had 159 grandchildren. his brothers Michel & Antoine. In 1700 he once again spent the winter at Chipoudie. In the summer of that year he settled at Grand-Pre. On Feb. 2, 1703 he married MARGUERITE HEBERT, the daughter of Emmanuel Hebert & Andree Brun. Marie Magdeleine born in 1703. Jean Baptiste born in 1707. Elizabeth born in 1710, does not appear in the 1714 census. JEAN-PIERRE died on Dec. 4, 1749 at the age of 69. Dugas at St. Charles-des-Mines Acadia. They were deported to Philadelphia during the expulsion of the Acadians in 1755. They stayed in the Philadelphia region until the 1760`s when they moved to the Quebec City area. Jean Baptiste born in 1745. PIERRE-PAUL-OLIVIER born in Grand-Pre in 1746. Francois DeGuise & Francoise Jourdain at the Cathedral of Notre-Dame de Quebec on Nov. 11, 1771. OLIVIER was born in Quebec City in 1777. In 1794 he was employed as a ships carpenter for The Royal Navy at Lake Champlain. He was also employed in this trade at Kingston. He married MARIE LOUISA GUILLOT, the daughter of Noel Guillot & Marie Louise Filion at The Cathedral of Notre Dame de Quebec on Feb. 2, 1797. Church. It served the needs of the Roman Catholic community until 1848 when St. Marys Cathedral was opened. OLIVIER was an innkeeper, he owned the National Hotel which stood at the corner of Wellington & Barrack Streets in Kingston. It was a popular site as a brewery & a bakery were close by. He also had a shipbuilding yard at Brown`s Bay on Wolfe Island, ( known then as Long Island ). Olivier applied for and received several grants of land from The Crown. restricted to commissary duties as his health was failing. Augustin ( Augustus ) born in 1808. Marie Louise born on Jan. 8, 1816. Catherine Rebecca born on Aug. 13, 1818. OLIVIER died in Kingston on Feb. 8, 1820 at the age of 43. Following his death MARIE LOUISA opened a tavern known as LOUISA THIBODO`S Coffee House. MARIE LOUISA died in Kingston on Jul. 31, 1822 at the age of 44. It is possible that they were both buried in the Churchyard of St. Joseph`s Church. In 1975 when this property was being redeveloped, the remains of 49 adults & 16 children were removed & re-interred in St. Mary`s Cemetery. There is a stone there attesting to this. Quebec for a period of four years, presumably to his uncle Paul. Upon his return to Kingston he salvaged what he could from his father's estate as it had been mismanaged. A manufacturer of farm equipment. A Lt. in The Kingston Volunteer Fire Company. A Lt. in The Kingston Volunteer Rifle Company. A Grand Trunk Railway Company station master. A collector of Inland Revenue. An alderman for three separate terms. Oliver John born in 1834. Frances Hope ( Fanny ) born in 1842. Augustus & Frances lived on Ontario St. in Kingston & attended St. James Anglican Church. Frances died on Nov. 9, 1890 at the age of 84 & is buried in Cataraqui Cemetery, Kingston. Augustus died one month later on Dec. 9, 1890 at the age of 82 & is buried in Cataraqui Cemetery, Kingston Ont. Cataraqui is a Native American term meaning the meeting of waters. At some point after the death of his parents, Olivier & Marie Louisa, Augustus became a member of the Church of England & a member of the Orange Order. The following is taken from the book, KINGSTON THE KINGSTOWN, pg 217-218. After the death of Bishop Macdonell, Father Remigius Gaulin put his plans into action to build a church larger & more suitable than St. Joseph`s. The corner stone of St. Mary`s Cathedral had been laid in 1842 & ever since the occasion, the Orangemen had been restive. In 1843 on the night of the "Glorious Twelfth" trouble broke out. It began when a drunken Orangeman, brandishing a brace of pistols announced to the milling crowd that he was "King Billy." The crowd thereupon closed in on Bishop Phelan Gaulin`s coadjutor & were prevented from assaulting his lordship only by the strong-arm methods of his personal bodyguard. charged with a fatal shooting. Four arch stones of St. Mary`s Cathedral were torn down by the mob & a portion of the walling. Two large moulds for octagon buttresses were smashed; the watchman's house was broken into & his bed & bedclothes were ruined by having water &ashes thrown upon them. Finally, two sculptured heads ornamenting the archway were mutilated & damage done to the extent of 50 pounds. Augustus Thibodo was not convicted of the fatal shooting as a true bill of indictment was not established. As a further note, Augustus Thibodo did not attend the marriage of his daughter, Frances Hope to James Moore on January 15, 1868. The marriage took place at St. Mary`s Cathedral. 1. Augustus James Thibodo was born in Kingston in 1832. He attended Queen's University at Kingston from 1851- 1854, graduating as a Doctor of Medicine. He was a great traveler & explorer. He traveled to California by water, crossing the Isthmus of Panama. It was on this trip that he met his future wife Maryann Jackson. In two years he acquired a considerable sum of money, of which when he returned to Kingston, his father insisted that he divide among his brothers. This he did but left home immediately. made a Fellow of The Royal College of Physicians & Surgeons. He returned to Canada in March of 1858, surviving a stormy passage of sixty-two days. Following his return, he practiced medicine as an Allopath in Merrickville Ontario. He stayed there only for a short time before departing on The Northwest Expedition of 1859. On Sept. 14, 1864 he married Maryann Jackson at Walla Walla Washington. In 1874 he received his MD. from Trinity College now affiliated with The University of Toronto. In 1869 he was the Coroner of Ada Idaho. In 1891 he was practicing medicine in Prairie City, Oregon. Augustus James died on December 31, 1929.
attorney there between 1902-1904. Augustus became interested in photography & was friends with Alfred Steiglitz, Clarence H. White, Adolf de Mayer, Max Weber, Rose Clark, F. Austin Lidbury, Wilbur Porterfield, Gertrude Kisebier, Edward Steichen & Alvin Langdon Coburn. 1900, Began photography as a hobby. 1908-1909, a member Photo-Pictorialists of Buffalo. 1910, Photographed the installation of the International Exhibition of Pictorial Photography at the Albright Art Gallery for Alfred Steiglitz. 1912, Commissioned by the Albright Art Gallery to create photographic tableaux for the fiftieth anniversary of the Buffalo Fine Arts Gallery. 1909, International Exposition of Photography, Dresden, Germany. 1910, International Exhibition of Pictorial Photography, Albright Art Gallery, Buffalo, International Exhibition of Photography, Budapest, Hungary. 1912, Progress of the Art of Photography, Montross Galleries, New York. 1914, An Exhibition of Works by Buffalo Artists, First Local Salon, Albright Art Gallery, Forty-forth Annual Exhibition of the Royal Photographic Society of Great Britain, London England. 1909, Bronze Medal at the International Exhibition of Photography at Dresden, Germany. 1910, Gold Medal at the International Exhibition of Pictorial Photography, Budapest, Hungary. Two of his photographs, The Lonely Pine Tree & Santa Lucia were purchased at this Exhibition. University, New Haven Connecticut, USA. B. Harry Thibodo born in Walla Walla Washington in 1867. C. Walter Whitman born in Walla Walla Washington in 1868. He died on Aug. 22, 1871 at the age of two years, 10 months. D. Francis Hope born in Idaho. He attended Queen's University at Kingston Ont. from 1893-1894. Graduating as an MD. in 1895. He was practicing medicine in Ventura California in the late 1890`s. He died in Ventura California on May 25, 1940. Arizona in 1891. He became a naturalized citizen of the United States on Aug. 21, 1889. From Phoenix he moved to California & died in Los Angeles Co. on Nov.26, 1911. He is buried in The Rosedale Cemetery, Los Angeles Ca. 3. Robert Thibodo was born in Kingston Ont. in 1836. He attended Queen`s University in Kingston from 1858-1862, graduating as an MD. He practiced medicine in Winnipeg Man. until his death on Aug. 1, 1887. His office was situated at 35 Market St. West in Winnipeg. His name is engraved on the back of his parent`s tombstone at Cataraqui Cemetery in Kingston. settled in New Liverpool Que. A. St. Clair A. Moore. Born in England in 1872. B. Violet G. Moore. Born in England in 1874. C. Monica A. Moore. Born in China in 1877.
as Kenora, Ont.). In 1911 he was living in Toronto at 455 Church Street. A. Mabel Florence born in 1869. B. Minnie born in 1871. C. Gwendoline born in 1874. 6. Jemima Thibodo was born in Kingston in 1848. She married the Reverend T.W. Barry an Anglican minister. She was staying with her father at the time of his death in 1890. In 1891 she & her husband were living in Fort Sully, South Dakota. Margaret Louisa born Feb. 15, 1845. Eliza Emily born in 1849. She died as an infant & is buried with her mother. Marie Louisa died on April 26, 1849 at the age of 33. She is buried in St. John`s Churchyard, Bath Ont. There are two Fairfield houses being preserved as historical sites. One is the family house at Fairfield Park near Amherstview, the other is in the village of Bath. 2. Rebecca Catherine Thibodo was born on in Kingston Aug. 13, 1818. She married Sylvester Madden. He was born in Canada in 1820. They lived in the Verona, Newburgh area of Ontario. Charles Augustus born in 1852. He died on Sept. 13, 1882 & is buried in the United Church Cemetery, Newburgh Adalade born in 1853. Mary Louisa born in 1856. She died on March 12, 1868 & is buried in the United Church Cemetery, Newburgh. Rebecca died at Newburgh on Nov. 16, 1891 at the age of 73. Sylvester died at Newburgh on April 10, 1895 at the age of 75. They are both buried in the United Church Cemetery, Newburgh. The Diary of Dr. Augustus James Thibodo. In 1755 the British required the Acadians to sign an oath of allegiance; the Acadians had previously signed such oaths but this one was unconditional. When they refused to sign, the decision was made to remove the French Acadians from Nova Scotia. On August 11, 1755 they were deported from Fort Cumberland, formerly known as Fort Beausejour. On September 5, 1755 the residents of Grand Pre & Pisiquit were required to assemble & were read the deportation order. The following is the order read at Grand Pre (spelling errors in original). I have received from his Excellency Governor Lawrence, The Kings Commission which I have in my hand & by whose orders you are convened to Manifest to you His Majesty`s final resolution to the French inhabitants of this his Province of Nova Scotia, who for almost half a Century have had more indulgence granted them, than any of his Subjects in any part of his Dominions, what you have made of them, you or your Self Best know. The Part of Duty I am now upon is while though necessary is very disagreeable to my natural make & temper as I know Must be Grievous to you who are from the Same Species. But it's not my Business to annimedvert but to obey Such orders as I receive, & therefore without Hesitation Shall Deliver to you his Majesty`s orders & instructions. vist. That your Lands & Tenements Cattle of all Kinds & Live Stock of all sorts are Forfeited to the Crown with all your other Effects saving your Money & Household Goods & you your Selves to be removed from this his Province. Thus it is Peremptorily his Majesty's orders That the whole French inhabitants of these districts, be removed, & I am Troh his Majesty's Goodness Directed to allow you Liberty to carry of your Money & household Goods as you Can without discomemoading the Vessels you go in. I shall do everything in my Power that all these Goods be Secured to you & that you are Not Molested in Carrying of them & also that whole Families Shall go in the same Vessel & make this remove which I am Sensible must give you a great Deal of Trouble as Easy as his Majesty's service will admit & hope that in whatever part of the world you may Fall you may be Faithful Subjects, a Peaceable & happy people. I Must also inform you That it is his Majesty's Pleasure that you remain in Security under the Inspection & Direction of the Troops that I have the Honor. to Command. And then declared them Kings Prisoners. Districts Without Special Order; Given at my Camp the Day & place above. Extracted from the Journal of Col. John Winslow of the Provincial Troops while engaged in removing the Acadian French Inhabitants from Grand Pre. Nova Scotia Historical Society Collections, Vol. 3, Halifax, 1883, pp. 94-95. The Acadians were sent to the various British colonies along the east coast from Massachusetts to South Carolina, some were sent to France and many died on the various ships. Few Acadians remained in Nova Scotia in hiding, but were subject to death if they were found. Others left for New Brunswick, most of those that made it surrendered at Fort Cumberland as many had died of starvation in Restigouche. Still others made their way to Louisiana & became the Cajuns. Some of the deported Acadians eventually made their way back to the Maritimes, including Nova Scotia & New Brunswick after they were given permission to return in 1764. They were however required to settle in less desirable areas. Others settled in Quebec. Many Acadians who were repatriated to France sailed to Louisiana in 1785, where many of their families had settled, (particularly from Maryland). The following is taken from The Bicentennial Reflections presented by The Stephen Women`s Club & printed in The Stephen Messenger on June 17, 1976. We had a chat with Mr. & Mrs RAY THIBODO during which RAY brought us on a nostalgic journey through the past, recalling memories of family & events. RAY`S father & mother, Mr. & Mrs Charles Thibodo, & seven children moved from Rushford in southern Minnesota in about the year 1903, to Stephen, drawn to this area by Mrs. Charles Thibodo`s sister, Mrs. Amos Wilson & a brother Ele Ensrud, who lived in the present Thomas P. Kuznia home. They were also influenced by the possibility of owning a livery stable in this "hub" of transportation. RAY`S first vivid memory of Stephen was that of a thriving busy community, an important freight & mail center, & exciting stagecoach station. Charles Thibodo operated a livery stable called the "West Stable" located where the Stennes - Hughes Funeral Chapel is presently located. Livery stables were very important & necessary businesses in the early days of every community, and much activity centered around these businesses. Before the Soo Line was laid east of here on the Thief River Falls & Karlstad side, all freight & mail for the eastern country: Greenbush, Badger, Pelan, Rousseau, & Warroad, was carried by horse-drawn wagons which took several days for a round trip. With luck, a round trip to Warroad could made in a week. The time needed to make a trip depended a lot on weather conditions which affected the already poor roads. The constant speed of the horses was very hard on them, so relay stations were situated along the way where teams were changed. One of these stations was at Pelan (known as the "Halfway House"). Livery stables weren`t only for hauling freight. People could & did rent horses & buggies or wagons for personal use. Twenty-five cents was charged for the use of a team for one day, and fifty cents for a day & overnight. Charles Thibodo operated this livery stable for five years. A foundry, a mill where metal was cast & made into machines was one of the nicest machine shops in this area. It was located on the present Stephen Implement site & was owned by C.K. Stockland. The annual Fourth of July festival was the big event of the year, & for some families it was the only community event that they participated in. It was a one day affair packed with activities including: foot races, games of chance, canoe races, river tub races & a parade, all in the setting of poplar trees decorated with colored ribbons & boardwalks shaded by a canopy of poplar trees which sheltered lemonade stands. For winter sports, RAY recollects privately owned ice skating rinks on the river with board fence & warming house. Initial charge was 15 cents for an evening or day. The appeal of the open country & a growing family, Walter & Lloyd had been added to the family while living in Stephen encouraged the Thibodos to move west of town to what we know as the Chris Flaten farm, where they lived for four years. In 1912 they bought a farm from John Amort near the Red River, & that farm remains in the family, the present home of RAY`S son & family, the James Thibodos. It is interesting to note that there is a log granary on that farm that is still in use. When asked about fun on the farm, RAY radiated excitement as he told about the steamboats that still travelled the Red River between Grand Forks & Winnipeg in 1908, & the time he helped load a barge with 2000 bushels of grain. Other activities included country dances with fiddlers or organ music, turkey raffles (a means by which farmers sold their turkeys), basket socials. fishing in the river, & frequent neighborhood family gatherings. Fishing was also a business & Mr. Beaudry caught fish & took them to Stephen to sell. When an itinerant Lutheran pastor from Stephen made an occasional trip to conduct services four miles south of the Thibodo farm, he would go as far as the Thibodo farm on Saturday night & stay over, continuing on the next day. Mrs. C. Thibodo was always a hospitable person & welcomed many travellers to rest awhile or remain overnight in their home. Two more children joined the family while living on the Flaten farm: Hazel (Mrs. Bert Walker) & Minnie (Mrs. Herman Lundeen). Hazel tells of going to grade school in the Eagle Point, & then attending high school at the Crookston AC. Minnie stayed with Donald Jorgenson`s grandparents while attending high school in Stephen & Walter stayed at his brother, Harry Thibodo`s home while attending high school. In 1935 Mr. & Mrs. Charles Thibodo moved into Stephen. He was very active in The First Presbyterian Church. RAY THIBODO took over the farm at that time. He reports that flooding was not much of a worry in the early days & 400 acres was considered a large farm in the"horse" days. When asked what his first job was on the farm as a boy, RAY answered with a chagrined grin,"With five boys before any girls arrived, I was appointed Mother`s helper, What else?" On this note we end our reminiscing with good friends & thank them for sharing this part of their past with us. The above article, presented by the Stephen Woman`s Club was written by Mrs. John Field & Mrs. Merv Anderson.